Events can also be subtler. In meditation provings one clear event is the meditation. This produces meditation symptoms like light feeling, floating sensation, tingling, hyperventilation, awareness of heartbeat, respiration and of the body. One can find symptoms like these in all meditation provings and most of the time they don't say anything about the remedy. None of them can guarantee complete and accurate results. Some homeopaths have the idea that dream or meditation provings cannot give correct results. 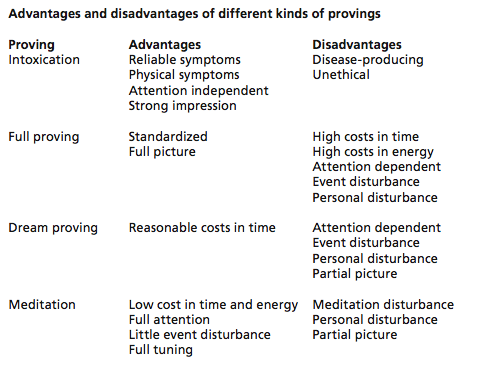 All provings have advantages and disadvantages and I’ve placed some of them in the table below. When used with care, the information in meditation provings can be and has been very helpful in the development of the remedy pictures. I publish them so that the reader can have a fuller picture of that development.